NETWORK UPDATE: There were no changes from the preliminary Saturday numbers. CABLE HIGHLIGHTS: The penultimate day of ESPN’s COLLEGE FOOTBALL season (but for the Championship Game on January 11) provided all of Saturday’s Top 4 cable broadcasts, with games at 1.97/1.68/1.49/1.17. Adult Swim returned to its late-night animated block after a holiday break, with DRAGON BALL Z at 0.57/1.29M, AKAME GA KILL at 0.48, PARASYTE at 0.45, SAMURAI CHAMPLOO at 0.41/936K, NARUTO at 0.33/738K, ONE PIECE at 0.33/667K, and KILL LA KILL at 0.26/547K. Fox Sports 1’s UFC PRELIMS was at 0.45. Lifetime’s original movie DON’T WAKE MOMMY scored 0.41, just ahead of Hallmark’s original movie LOVE IN PARADISE at 0.39. 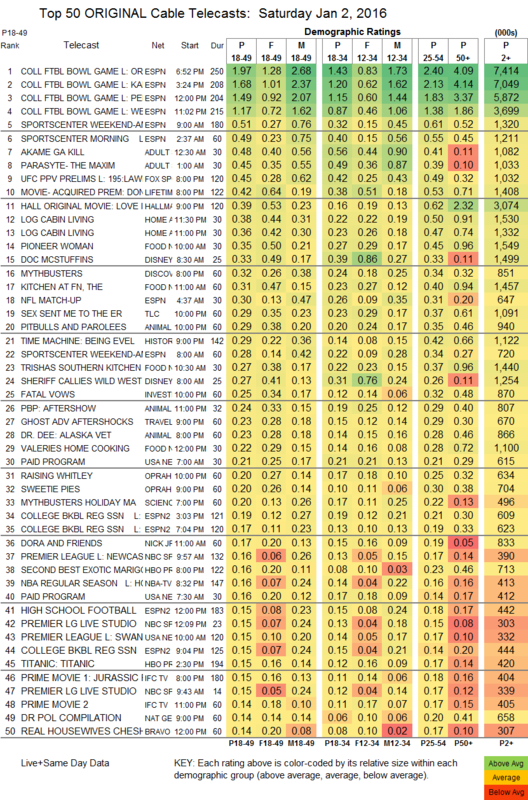 Two episodes of LOG CABIN LIVING were at 0.38/0.36 for HGTV. 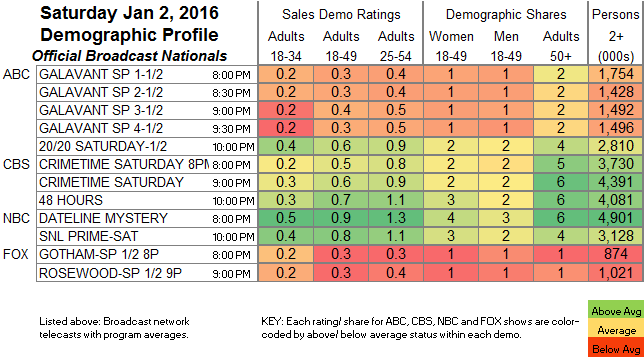 Food Network had PIONEER WOMAN at 0.35 and KITCHEN AT FN at 0.31. Discovery’s MYTHBUSTERS was at 0.32. For some reason, either Starz or Nielsen listed all the season finale for ASH VS. EVIL DEAD as a rerun, but it was up 0.07 from last week to 0.21, with 508K total viewers. Esquire’s SPOTLESS stayed at 0.02/73K.